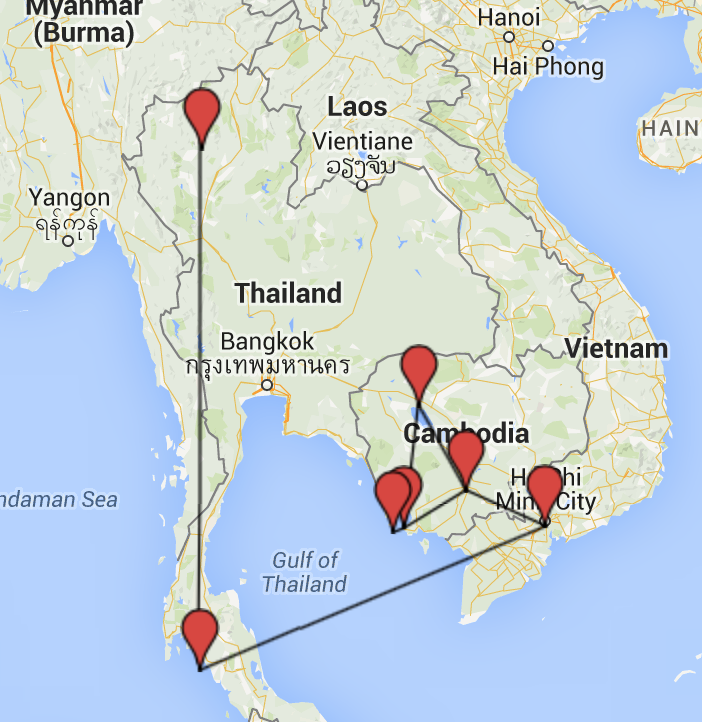 Month four of my round-the-world trip was my first full month in Asia. 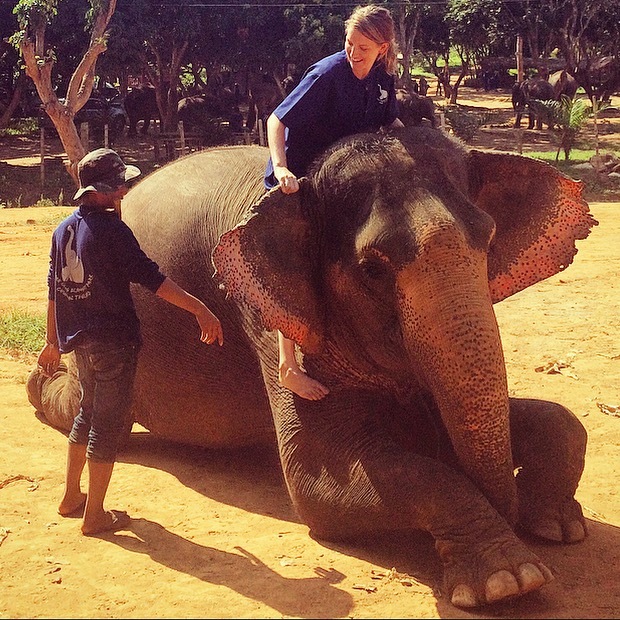 It was immediately apparent in entering Thailand, that my previous three months spent in Europe were all preparation for this entirely different set of challenges. Whenever I’ve known a solo traveler who went to very exotic places (pretty much anywhere outside of the U.S, Europe, New Zealand, and Australia), I looked at them in awe, but had absolutely no desire to do something similar. I had really never considered it, until one day I did consider it. From then on, the idea of learning about the ways of the world outside of Western culture was something I needed to do, despite the fact that I knew it would be really hard. On arrival, I realized very quickly that I did not want to do the typical “backpacker trail” – Thailand, Laos, down Vietnam, over to Cambodia, and sometimes Myanmar. 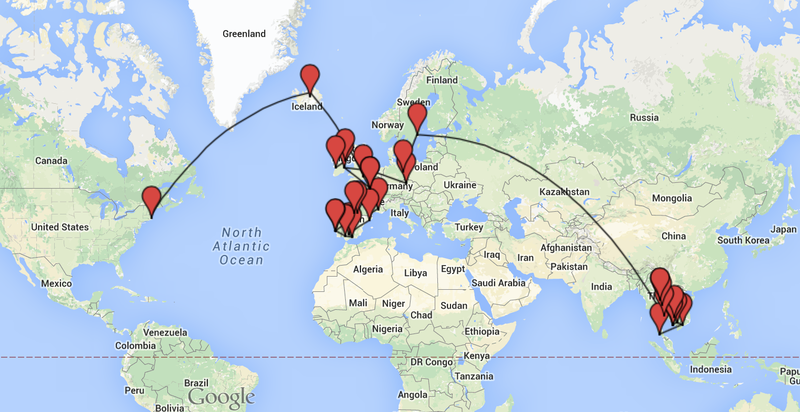 (Or the same destinations in the reverse order.) It felt like a way of traveling that focused much more on sightseeing, meeting friends, and moving constantly, which is what I had done in Europe. I was tired from it and really didn’t have the energy to do it all again but in more exotic locations. Once I nixed the trail, I thought to myself, “Ok so why the heck am I here? !” And, as it turns out, I was in Southeast Asia for the understanding of different lifestyles, confidence to be able to be alone, and a whole slew of other things that I still struggle to put into words. During this month, there was a lot of intense emotion at all times. It was not bad necessarily, but there was a constant awareness of my own feelings and needs that ultimately drove all of my decisions. Messing around with Michelle in Ko Lanta. She and I met in Portugal at surf camp and became instant friends. We were both single women traveling both Europe and Southeast Asia at the same time and, luckily, we were able to meet up again in Thailand. It was the very tail end of her trip before returning to her home, New Zealand. So, we did yoga, had great dinners, and explored the island. 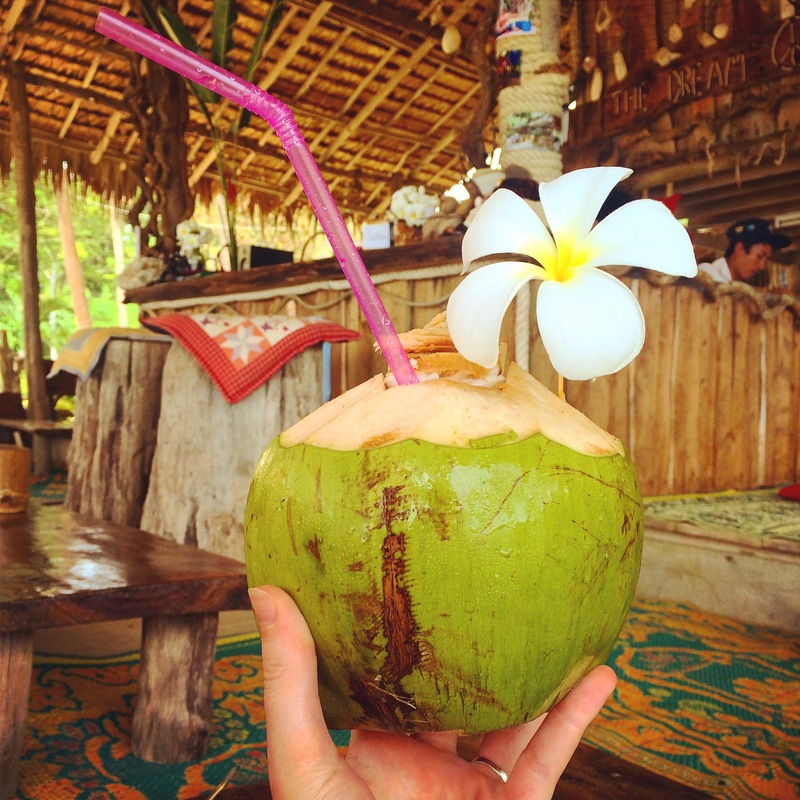 Our craziest day involved beach hopping around the southern part of Ko Lanta. At the advice of a local, we took a shortcut through a jungle and narrowly missed (what I believe was) a snake. I awkwardly blew the whistle on my backpack (I bought it for safety and the explanation I usually give when people ask why I have it is “In case I am sliding off a glacier someday,” but this was the first time I had used it). Michelle wasn’t really sure what the whistle would do if it was a snake, neither was I. We luckily never found out. On the same day, took the sweatiest hike in history, kayaked against a strong current, and encountered some greedy monkeys. After Michelle left, I spent 8 days solo on Ko Lanta and learned how wonderful extended solitude can be. I documented those lovely days here. 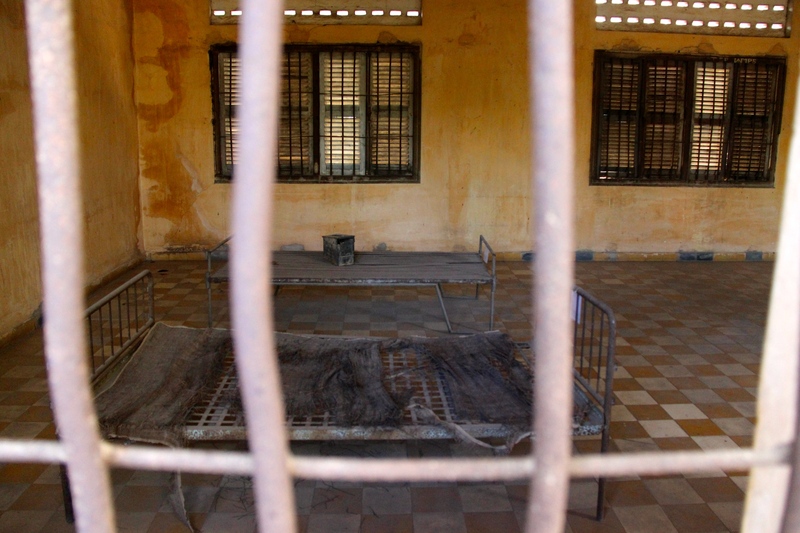 There were some really tough days in Cambodia – the toughest was visiting S-21 Prison Camp and the Killing Fields in Phnom Penh. The history was hard to understand and hard to digest. I explain in a lot more detail here. Watching Pas fire dance every night in Ko Lanta. It’s something a lot of people have seen if they’ve been to Thailand, but regardless, I loved watching it and seeing how his body moved and how the fire looked through my lens. There’s a magic to it. Playing cards with Lindsey and Jake on Koh Rong Samloem while sipping mango cocktails. Hanging out in Chiang Mai with Michelle, Carina, Pew, Brian, and Aok. We had some epic meals and fun nights around the northern Thai city. Getting food poisoning from a Cambodian veggie noodle dish. I was bedridden for three days and it was right after my sister left. I took a day trip to the Cu Chi Tunnels from Ho Chi Minh City with my friend Greg. The tunnels are located about 90 minutes outside of the city and we got on at 8am. “Mr. Bean” was our tour guide and he gave us a full tour of “Vietnamese history” (or his very biased version of it) for the full duration of the bus ride, which sometimes included yelling or singing. It was extremely uncomfortable and exhausting, particularly for Greg who was sitting right next to where Mr. Bean stood throughout the ride on his microphone. He also took us through the tour, so there was no break from the heavy rant and slight guilt trip (or at least, as an American I felt a lot of guilt). On the way home, he got right back at it but had also consumed a few more adult beverages, so it was louder and more intense. The weirdest moment of the whole day was when Mr. Bean tried to get the whole tour group to sing the Beatles’ “Hey Jude” all together right after everyone had just gone through the tunnel system. I wasn’t really in the mood to sing in unison with a bunch of strangers after seeing the panic-inducing system of underground tunnels the Viet Cong lived in, but hey that’s just me! It was a really odd day overall. Greg and I had to have a beer immediately after to decompress. Buying what I call “backpacker pants” – ya know, those baggy thin cotton elastic waist pants that all backpackers seem to be wearing? I never thought I would be one of the people who wears them, but alas, they are cheap, super comfortable, and really functional. Especially because in temples you need covered legs, these offer coverage without being too hot. I wore them to yoga yesterday too… I’m long gone. 3588. I’m very proud to say, that’s an average of 119 photos per day. Back at it! Angkor Archelogical Park in Siem Reap, Cambodia. Each wat (temple) got more beautiful and they were all quite different. It’s a must see. In Chiang Mai, I met up with Michelle and some of her friends, one of whom was Thai and gave us the in on the best places to eat in the city. We were taken to several fantastic meals, but my favorite meal was the Chiang Mai noodles, which had coconut milk, chicken, veggies, and some kick. 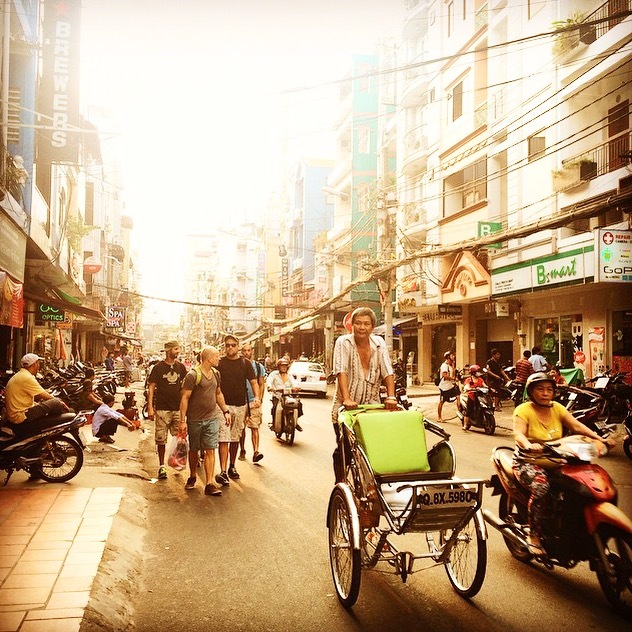 Lindsey, Jake, and I went on a XO Tours’ Motorbike Street Food Tour of Saigon. The tour was fantastic, taking us out of the tourist district and to the various other areas of Saigon by motorbike to taste other local street foods. 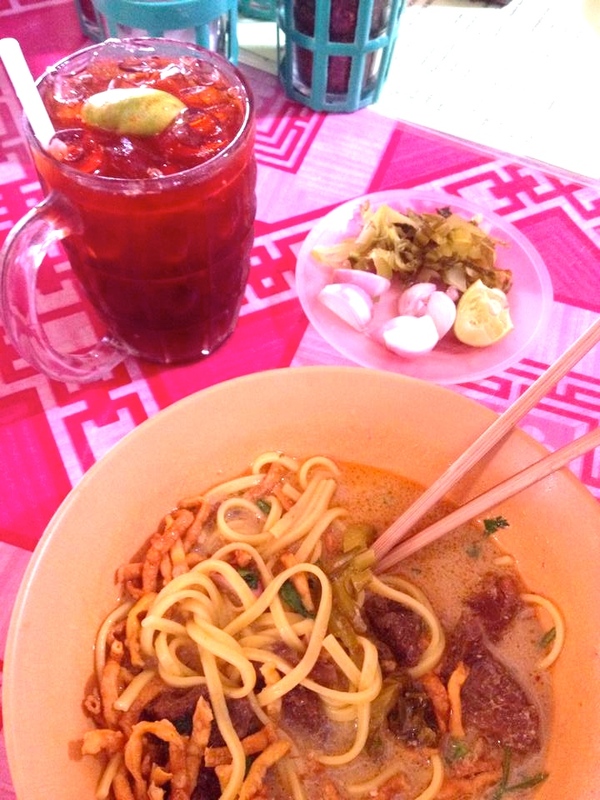 Bun bo hue was my favorite thing we had – beef and pork noodle soup with lots of lemongrass. We had cang nghe rang muoi ot (crab with chili and salt), vu de nuong chao (goat breast), so diep nuong mo hanh (scallops with peanuts), balut (baby duckling in the egg), as well as frog, okra, and other little bites. Ko Lanta or Saigon. They might as well be opposites, but I really enjoyed both. Ko Lanta had the relaxed island vibe and Saigon had the crazy Asian city vibe (which I used to be scared of but have grown to love). Chiang Mai was lovely too. It’s really hard to choose! The Daily Panic: Whenever I think of where I am in the world, I get a slight moment of panic. I think it has to do with knowing that all of the people I love are entire continents away – every single one of them. It’s a really unsettling thing to think every day, but I’ve gotten used to it, knowing that it isn’t forever and it’s making me stronger. The Introverted Extravert: I discovered this month that I, a pretty big extravert, need alone time. A lot of it. And I spent 8 days alone without feeling at all sad or lonely the whole time. Since completing this time in solitude, I have lost all anxiousness around being lonely, which, if you’re traveling alone, is a constant concern. Now, I know I am ok without anyone else for extended periods – it’s really empowering and it’s not something I expected to feel… ever. It feels like I’ve become friends with myself, which sounds really odd, but before my time in solitude, I always felt the need for distractions that came from other people. Now I do not and I make sure to incorporate time alone into every day – whether that’s a little or a lot. Many Roles: As I was dreading, I found out that reconciling my travel self to my home self will not be easy. I got a taste of it when I saw my sister and totally freaked – trying to figure out who I had become and how to act around people who knew me before I started traveling. It was a really odd, unsettling feeling. It’s something I am able to discuss with people openly, luckily, which I hope will help with the transition. Reaching Limits: I am tired of people. There, I said it. I didn’t have any desire to make any new friends once I got to Asia, which was a problem considering I had very few friends on the continent with me. I had made such wonderful friends in Europe and have been trying to keep up with lots of people from home. What I figured out was that I can find the space for the really good ones, other than them, I can do what I want. It’s all seemed to work out – I am happy to be alone more often and I find friends easily when I need them. Temporary Personality Traits: I am a person who values humor and wit highly, but I found this month that my sense of humor seems secondary in a way that it never did before. I am, instead, taking in my surroundings and am less likely to crack a joke or chatter about nonsense. I’m wondering if this is temporary or if my personality has made major changes. TBD I suppose! It was a month full of self-discovery, which was difficult but also incredibly fruitful. It was what I knew I needed to experience to really have the trip I was hoping for – I needed to face all the hard stuff I couldn’t possibly plan and can’t avoid. Most travelers don’t seem to have this same need for moment-by-moment self-awareness. I am a different breed than most, I guess. But I spent the month without wanting to distract myself and, instead, with the desire to face whatever I was feeling head-on. It is really hard to explain what that was and why I needed to sit with it so often, but in any case, it was a big, heavy, intense month. Love it — especially everything in the Biggest Surprises section!! Thank you….